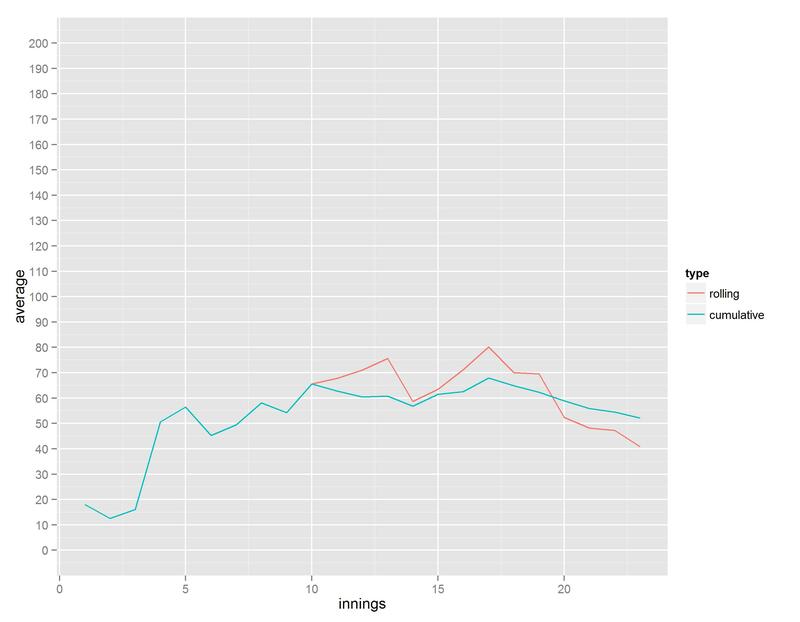 Using R to calculate better cricket statistics… or, how to revolutionise the way we slag off Ian Bell. Have you ever been bothered by the idea of career batting averages, how it doesn’t reflect a player’s form, and how it’s unfair to compare averages of cricketers who’ve played over a hundred tests to cricketers who’ve played maybe thirty since one bad innings will damage the experienced cricketer’s average way less than the relative newcomer? Well, you’re not alone. I’ve always thought that cricinfo should report a ten-innings rolling average. Occasionally you get a stat like “Cook is averaging 60 or so in the last few matches” or whatever, but there’s no functionality on cricinfo or statsguru to be able to look that up. 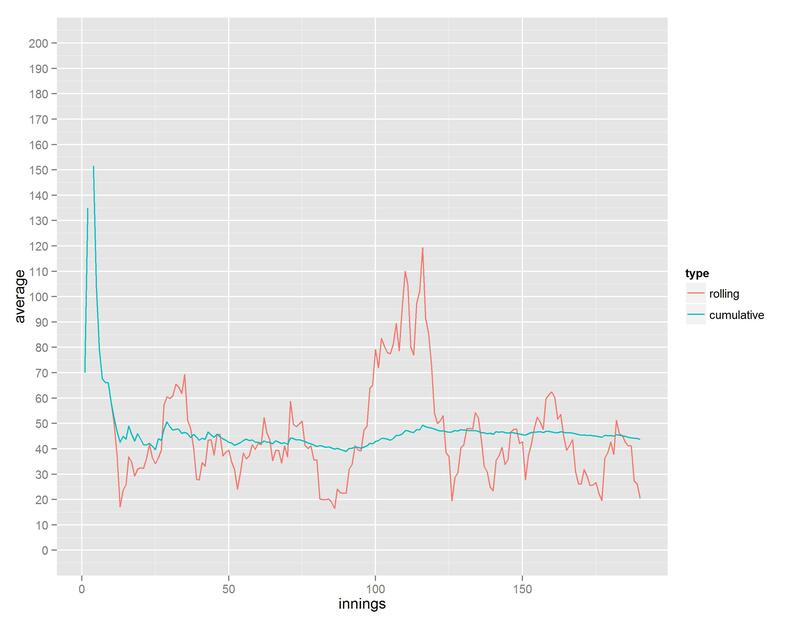 Enter R. R is a free open-source statistical programme that I normally use for my ERP research, but it’s also the next best thing after Andy Zaltzman for settling arguments about cricket statistics. 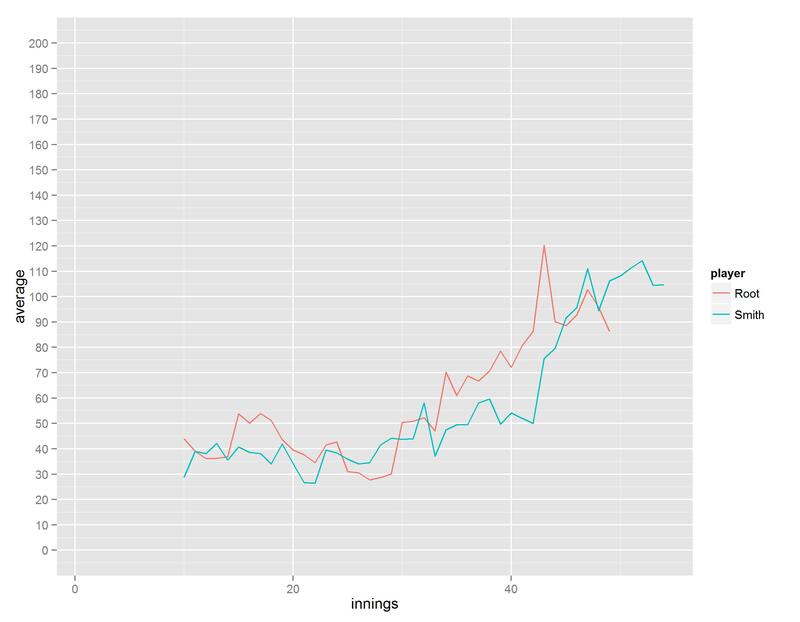 I’ve written some R code which can take any cricketer on cricinfo and spit out a ten-innings rolling average to show fluctuations in form. 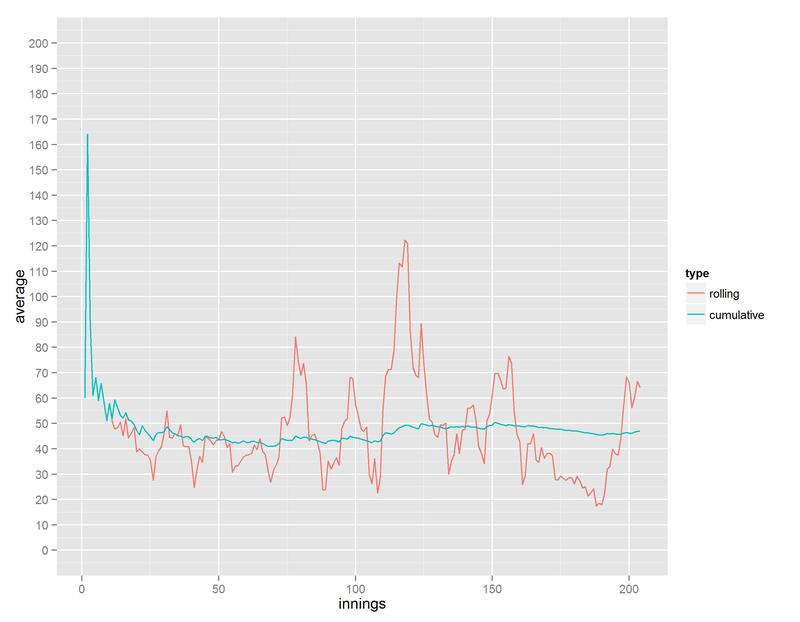 Plotting it with ggplot2 can show a player’s peaks and troughs as compared to their career average, and can hopefully be used as a much more objective way of saying whether or not somebody’s playing badly. Alastair Cook has been a lightning rod for criticism in the last couple of years. He scored heavily in his first few matches as England captain, and for a little while it seemed as though captaincy would improve his batting, but then he went into a long slump. He recently broke his century drought, and people are divided over whether he’s finally hitting form again or whether this is a dead cat bounce on an inevitable decline. Some people take his last five Tests and say he’s back; others take his last year or two in Tests and say he’s lost it. What is missing from all the misspelled derision in the comments under any article about Cook is a ten-innings rolling average and how it changes over time. This graph shows Cook’s peaks and troughs in form quite nicely. The big one in the middle where he averaged about 120 over ten innings is a combination of his mammoth 2010-11 Ashes series and the home series against Sri Lanka where he scored three centuries in four innings. His recent slump can be seen in the extended low from his 160th innings and onwards, where his rolling average went down to below 20. Now, though, it’s clear that not only has he regained some form, he’s actually on one of the better runs of his career. Similarly, it seems like commentators and online commenters alike feel like Gary Ballance should be dropped because he’s on a terrible run of form. Certainly, he’s had a few disappointing innings against the West Indies and New Zealand lately, but is his form that bad? …no, no it isn’t. He’s still averaging 40 in his last ten innings. Bell’s average has had a few serious drops recently, going down to 20 after a poor Ashes series in Australia (along with pretty much every other England player too), rebounding a bit after a healthy home series against India, and then plummeting back down to 20 after two bad series against West Indies and New Zealand. Unlike Cook, however, Bell never seems to stay in a rut of bad form for very long… but that never stops his detractors from claiming he hasn’t been good since 2011. The missing bit in the cumulative average line, by the way, is from where Bell averaged a triple Bradman-esque 297 after his first three innings against West Indies and Bangladesh, which were 70, 65*, and 162*. …but it appears that there’s not actually much to choose between them. If anything, Root has had the highest peak out of the two of them, averaging 120 over ten innings against India last summer and the West Indies more recently (this is in fact comparable to Alastair Cook’s peak against Australia in 2010-11, but has attracted far less attention). He’s dropped a little since, but is still averaging a more than acceptable 85. Smith’s current rolling average of 105 is also very impressive, and it’ll be fascinating to see how he gets on in this series. If you are interested in calculating and plotting these graphs yourself, you can follow the R code as below. Root.full = Root.tables$"Innings by innings list"